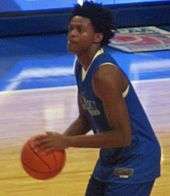 De'Aaron Fox (born December 20, 1997) is an American College basketball player For the Kentucky Wildcats. Fox was the sixth ranked player in the 2016 college recruiting class. He committed to Kentucky on November 12, live on ESPNU. He chose Kentucky over Kansas, Louisville, and LSU. Fox attended Cypress Lakes High School in Katy, Texas. Fox averaged 23.8 points per game his senior year in 20 games. 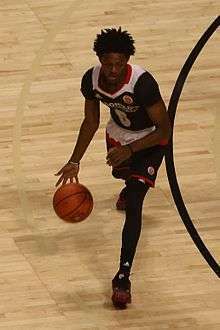 Fox participated in McDonald's All-American, Jordan Brand Classic, and Nike Hoop Summit Games. He was the nation's consensus top point guard, was ranked the consensus No. 3 overall player by the four main recruiting services Rivals, ESPN, Scout, and 24/7 Sports. On November 12, 2015 Fox Committed to the University of Kentucky to play college basketball for Head Coach John Calipari. ↑ "De'Aaron Fox". ESPN. ESPN. Retrieved 25 April 2016. ↑ "Point guard De'Aaron Fox, No. 7 in ESPN 100, chooses Kentucky". ESPN.com. 2015-11-12. Retrieved 2015-11-12. ↑ "De'aaron Fox". 247 Sports. 247 Sports. Retrieved 25 April 2016. ↑ "Kentucky Men's Basketball Signs Six in Fall Signing Period". University of Kentucky. 2014-11-19. Retrieved 2015-11-19.